Indian Vanity Case: Stiletto Hardware For Comfy Shoes! Stiletto Hardware For Comfy Shoes! Some stuff their bras, some stuff their pants, I stuff my shoes. Most of you know I have tiny & slender feet and I don't find grown-up shoes that fit properly. I have bought all types of padding from Scholl- some good, some useless. So, to sum it all up, my feet suffer terribly after a day in high heels. 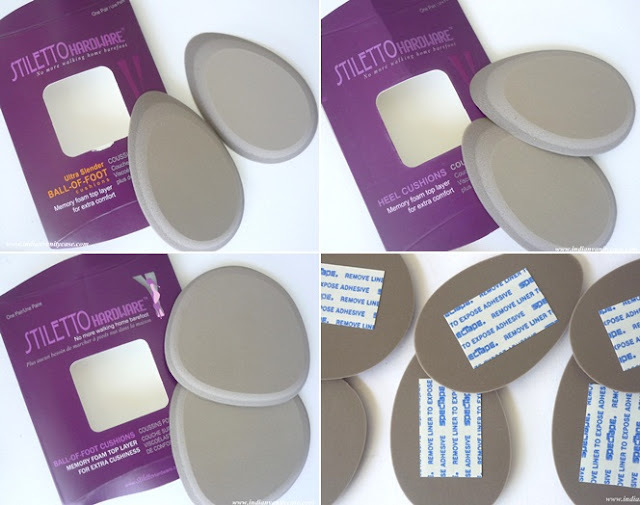 That's why I was more than happy to try out Stiletto Hardware insoles. You can remove liner from the back if you want to stick them to your shoes. I tested the big Ball-Of-Foot-Cushions on a new pair of shoes that barely fit me- reason why I've never worn them outside the house. Tada! I walked...I jumped...I danced. Not only this pair, I even used the same cushion on my bow shoes (that I'd never worn for long coz they are very loose) and I could walk. I. COULD.WALK. Tested the same cushions on my black peep-toe slingbacks too and the strap behind no longer slipped down when I walked. ♥ They are smooth and soft, making shoes more comfortable. ♥ It's not necessary to stick them to your shoes. I prefer it that way, so it's easier for me to switch them from one pair to another. ♥ The glue behind doesn't spoil my shoes. 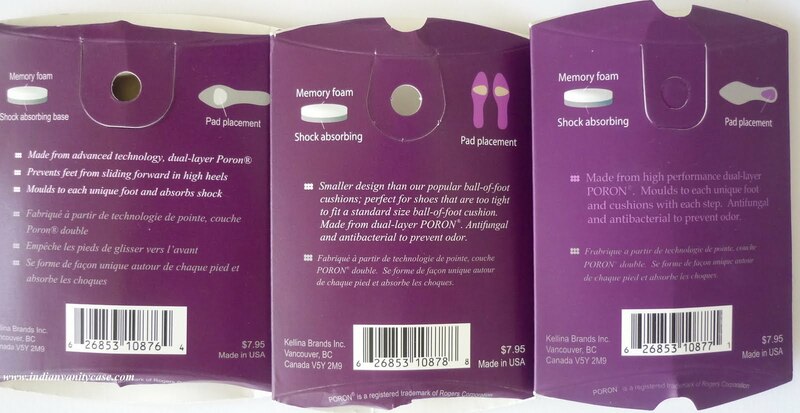 I had a pair of shoe padding which ruined my shoes in the past6. - Packaging could be better. - Quite pricey at $7.95 (Rs.380.00) a pair. But if you plan to buy just 1 for all your shoes then it's justified. Would I repurchase? Yes. At least 2 types will come in handy. It's very possible I might need them for the rest of my life. Disclosure: Products sent by the company for consideration. As always, all opinions are my own & I am not being paid for this. Can't wait to try these out! I have so many shoes that are "dinner only" because they are so uncomfortable! thes r lyk a must-haves!! I have unevenly sized feet so something like this is perfect for me! Once I get around to putting them in my shoes I mean. I just could notice only ur lovely nails and nail paint !!! hey i wear size four ! i never get my size . will these work for me ?? Marbear- Ya, me too...lots of uncomfy shoes! Hi! I have been a silent follower of your blog for so long now! I love it! I have a pair of peep-toe pumps (5inch heels) that are a size too big for me. They are pretty snug around the toes but slip from the back. Are there any kinda inserts that might help? I tried scholls liner but its so useless!!! Any suggestions? Wow, what a difference they make! Happy shoes, happy you! OMG..!!!!!!!!! Ty so sooo much for sharing this..!!! My feets r so small that i never find my size :( is always swings between size 34-35 or indian size 2-3.. :( Where do u buy your shoes from?? Do u shop online for shoes?